Dad (Joe R.) and I (Joe A.) took a road trip to the 5th annual Tesla Rally in Custer, South Dakota. Keep reading for a quick recap of our trip, or skip right to the pictures. We drove about 420 miles almost straight north from Colorado Springs, into Cheyenne, WY, then Lusk, WY, then Custer, SD. We left the Springs around 6am on Friday, May 18th. We hit some morning rush hour traffic in Denver, but were in no hurry, so we dealt with it. And by we, I mean the car. Autopilot is great for this. Dad and I simply relaxed, chatted and listened to music while the car did all the work. Stopping and starting, following traffic all by itself as we glided through Denver morning traffic. Once, finally out of traffic, we continued our journey to Cheyenne, WY, where we would stop for our first Supercharging. 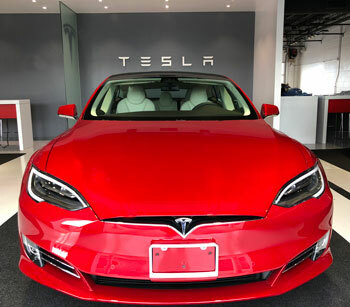 The Supercharger is free, so it's like getting free gasoline. We stopped for about 30 minutes. Just enough time to use the restroom, and chat for a few minutes with another Tesla Rally goer who was traveling from Denver. Once the car had enough electrons, we were on our way! The next stop for charging was in Lusk, WY. Both Lusk and Cheyenne are some of the oldest supercharges in the country. They are each only 4 stalls, meaning only 4 Teslas can charge there at once. Luckily for us, neither was full, and we were able to start charging right away. In Lusk, the supercharger is located at a small hotel that had a nice outside area with some picnic tables and chairs. Mom was kind enough to pack lunch for us, so Dad and I ate while we waited for the car to charge. We also met up with the same Rally goer we met in Cheyenne earlier and had a nice conversation. About 45 minutes later, both the car and us were refueled and ready to go. On to Custer! We arrived in Custer with plenty of time before the welcome dinner and meet and greet started. We checked in at our motel, and then at the Chamber of Commerce, got some swag, and then headed to Crazy Horse Memorial (only 6 miles from town) to scope it out. After that we joined up with the group for the meet and greet and to have dinner. Saturday began with an official ribbon cutting at the brand spanking new 8 stall Tesla Supercharging station that had just opened in Custer. A Tesla employee, who was integral in development of the station, was there to help commemorate the event. After that, Dad and I headed off to take a drive through Custer State Park. It was a quiet, cloudy day. During our drive, we stumbled upon a huge herd of buffalo! There was lots of calves among the herd. Some crossed the road right in front of us, one getting as close to 6-10 feet of the car. It made us a little nervous, but thankfully, no Teslas or buffalos were harmed! Once out of the park, we headed up Iron Mountain road. At one of the many camp sites along the way, we saw a sign that read "live wolves". Well, I just had to pull over and see what that was all about. Turns out, the camp owners had 2 wolves that were born in captivity, and they chose to raise. One was a timber wolf, the other an arctic wolf. I absolutely love wolves, so I was in heaven. After getting up close and taking some photos, we made our way to Mt. Rushmore. After a quick stop at Rushmore, we went to the Crazy Horse Monument. We had a nice lunch in the Laughing Water restaurant overlooking the monument. 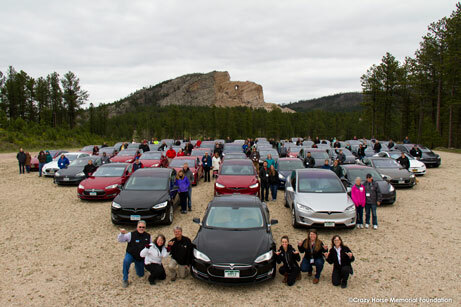 After walking through the "museum" and watching a video telling the story of the monument, we met up with the Tesla group for the official photo (pictured above). From there, the group once again met for dinner in Custer. We met some great people and had fun conversations with all kinds of interesting stories. On, Sunday it was time for the drive back. Once again, we had a lovely drive, stopping in both Lusk and Cheyenne for juice. All in all, there were a total of 61 cars signed up to participate in the event. 54 cars made it, with about 100-120 people. It was the largest turnout for the event they've ever had. People came from all over the country. The farthest traveled from Florida and there was even a couple from British Columbia, Canada. We both had a great time and look forward to going again next year! For more info, you can check out the Black Hills Sound of Silence Tesla Rally Facebook page here. Also, check out the Colorado Springs EV Club website.